Barnett Engineering & Signaling Laboratories, LLC (BESL) is a veteran owned and operated small business established in 2006 and headquartered in Colorado Springs, CO. BESL provides specialized intelligence, technical and engineering support services to a wide range of government customers. The team contributes to the defense of the United States by providing tailored products and services in the following areas: Intelligence Analysis, Operations Research and Analysis, Prototype and Systems Development, Operations and Maintenance (O&M), Tactics, Techniques and Procedures (TTP), Research and Development (R&D), Test and Evaluation, and Training and Education. Additionally, as a technology oriented company, BESL provides expertise in areas of Counterspace Operations, Electronic Warfare, Ground-based SATCOM Geo-location, Satellite Operations, just-in-time training for deploying operators, Training Systems Requirements Analysis, Training Development, Systems Engineering documentation, Cyber Information and Operations, and Intelligence. Bevilacqua Research Corporation (BRC) is a Service Disabled Veteran Owned, small business (SDVOB) firm with corporate headquarters in Huntsville, Alabama. BRC was established in 1992 to provide innovative, leading edge technology products and services to government and private sector clients. We have provided expert support to the Department of Defense and other government agencies for over 20 years, successfully performing over 110 contracts with no negative performance assessments. 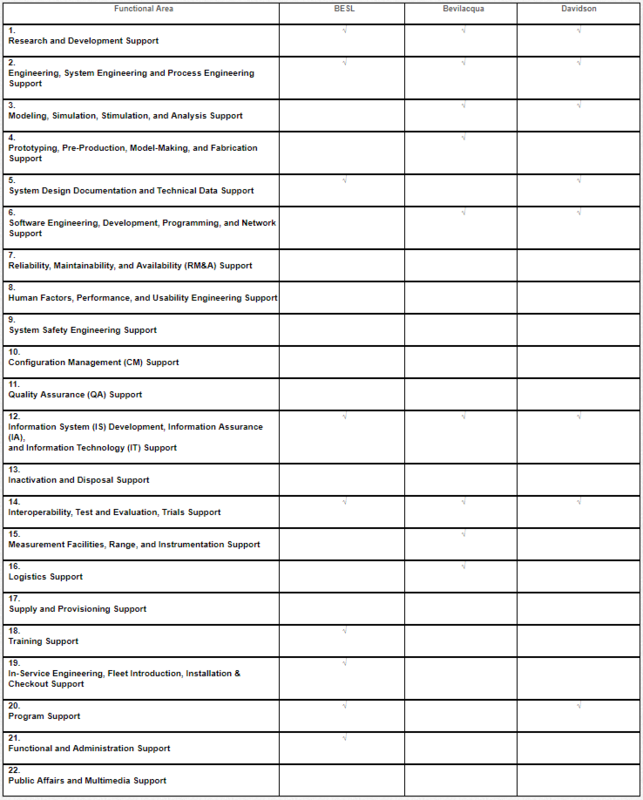 Support areas include RDT&E support, systems engineering, engineering, software development , and technical assistance for intelligence and electronic warfare, threat systems, explosive phenomenology, target vulnerability assessments, weapons effects, modeling and simulations, C4ISR and C2BMC, IMINT, low observables testing, and laboratory support. BRC’s current employment is 200 and provides Government customer on-site support to AFRL, Edwards AFB; Air Armament Center, Eglin AFB; AFRL and NASIC at Wright Patterson AFB; USACE Engineer Research Development Center (ERDC), Vicksburg, MS; PEO Soldier at Fort Belvoir and Aberdeen Proving Grounds; MDA at Redstone Arsenal in Huntsville, AL; NASA/MSFC, Huntsville; DOI/BIA in Herndon, VA; and recently supported CENTCOM, EUCOM and AFRICOM. Davidson Technologies is a cutting-edge technology services company dedicated to providing innovative engineering, technical and management solutions for our defense, aerospace and commercial customers. Dr. Davidson, founder of Davidson Technologies, envisioned a company that would be customer focused and solution oriented, all within an atmosphere that attracts and retains quality professionals with extensive technical knowledge. Davidson Technologies has distinguished itself in the aerospace and missile defense industry with an outstanding reputation for excellence. Specifically, DTI is recognized for hiring noted experts, and experienced engineers and scientists who are dedicated to providing our customers with solutions to complex problems in a timely and uniquely responsive way. DTI is dedicated to our nation's defense and our nation's exploration of space. Quality has different definitions for different customers. At BESL, we understand this and it’s why our Quality Management program starts with early customer involvement to define customer requirements, performance goals, and realistic measurement metrics to sustain repeatable, top-level results. documentation are compliant with the plan, as well as communicating feedback to the project team. Quality metrics are reported during Monthly Status Reports and, as necessary, proposed changes are reported through the Change Control Board for consideration and implementation. Our quality assurance processes help us to maximize project efficiency and minimize waste.